After having so much fun taking part in the last JustRite Friday Challenge I thought that I would try again this week. I loved the theme ... JustRite Friday Challenge #103 is "Things With Wings". It is a challenge that also is shared by Spellbinder's meaning that on your card you need to use both JustRite Stamp's/Die's as well as Spellbinder Dies. And, I had an idea almost from the second that I read the theme. 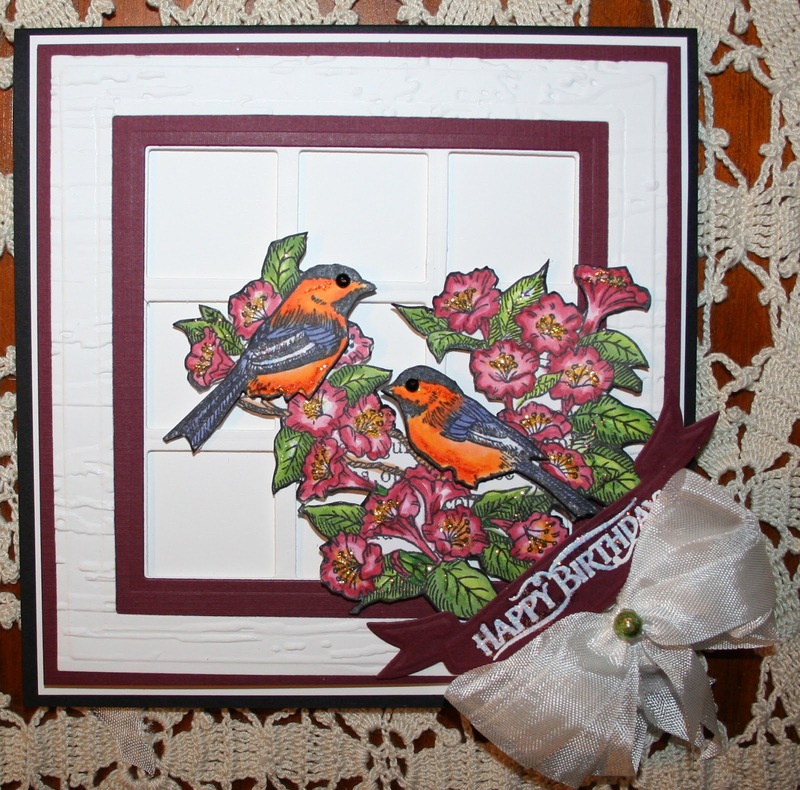 I wanted to make my own window out of Spellbinder dies and then fussy cut a stamped image to use with the "window". I wanted to use THIS beautiful JustRite background stamp and basically just ink up and fussy cut the birds and the flowers. Which I did because I planned to put them in front of Spellbinder window of my own creation. I do have a Spellbinder window die....but it was too small and too fancy for the image. So, I decided to "make" my own window by cutting a large square from my Spellbinder die and then measuring and cutting a much, much smaller square die 9 times to make a 9 paned window. Which turned out great once I finally got the measurements down right! Then, I cut two frames, one in white and one in maroon to highlight the window and give some depth to the image. I then embossed the white window frame in the "wood" embossing folder to give the window some texture. I cut and colored out the birds a second time and popped them up on dots and stickled in the centers of the flowers as well as the leaves, the lettering and slight bits on the birds themselves. Lovely card, and what a lot of work! All that fussy cutting and (yikes! )math,really paid off. Love the window idea! You are so clever, Sheila! I love your window and this is such an adorable card, too. Good luck in the challenge. 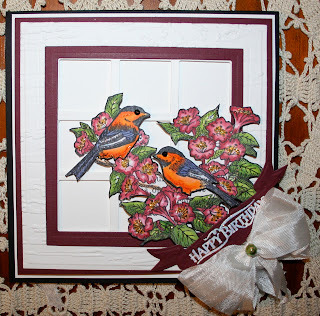 Beautiful card love the window you created and the fussy cut image looks fabulous in it . Good luck in the challenge . Tks. for dropping by my blog and leaving such a lovely comment. ingenious use of your dies to make your window. Love the birds ~ so beautifully coloured. This is stunning. Your coloring is gorgeous. I love the vibrant colors. Wonderful creation, Sheila! Love your creativity & gorgeous coloring! Truly amazing, Sheila! You must never sleep, with the great thoughts and all that coloring and cutting - ha! Love your creativity and depth here. Have missed checking in - hope you are having a great summer. amazing fussy cutting! and I absolutely LOVE your color choices! Wow, Sheila, this is AMAZING and beautifully done (not at all easy for me when fussy cutting)!!! LOVE your pinkalicious card too!!! Wish I'd gotten more than one made!